So much here. 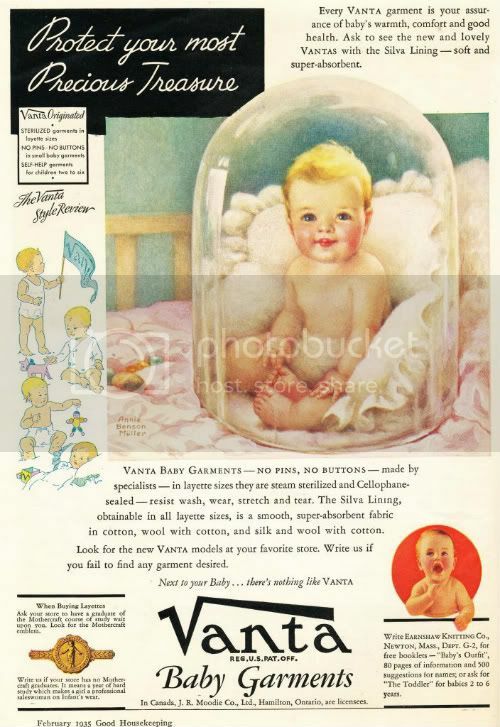 A baby in a bubble, the mysterious Silva Lining, charming illustrations, 500 baby names and a career offer! "Vanta Baby Garments - No Pins, No Buttons - made by specialists - in layette sizes they are steam sterilized and Cellophane-sealed - resist wash, wear, stretch and tear. The Silva Lining, obtainable in all layette sizes, is a smooth, super-absorbent fabric in cotton, wool with cotton, and silk and wool with cotton." We also get "The Vanta Style Review" of sweet babes wearing these amazing garments. Then there is the pretty, but odd baby under glass illustration by Annie Benson Muller (she was a prolific illustrator, but I couldn't find out much about her life). This picture and much of the text stresses how sanitary everything is. Which may have been a response to the Polio epidemics that frightened everyone (the most memorable was in 1916, but outbreaks continued through the 1950's). You also have an offer to write for a booklet -"Write EARNSHAW KNITTING CO.,NEWTON, MASS., DEPT. G-2, for free booklets - "Baby's Outfit", 80 pages of information and 500 suggestions for names; or ask for "The Toddler" for babies 2 to 6 years." "When Buying Layettes - Ask your store to have a graduate of the Mothercraft course of study wait upon you. Look for the Mothercraft emblem. Write us if your store has no Mothercraft graduates. It means a year of hard study which makes a girl a professional saleswoman on Infant's wear." "Next to your Baby...there's nothing like Vanta"
Oh no! My daughters were deprived! Strangely creepy picture.